You can either make a booking directly on this website by using the "check availability box" to the left. Or you can call our office at 859-363-6091 and a receptionist will be glad to help you. -Check in is any time after 4PM: we do not have a formal check in process, simply follow the instructions you receive via email and go to your cabin any time after 4PM. When you book your rental, there is an option to have an early check in time of 2PM for a fee of $30. -Check out is any time before 10AM: we do not have a formal check out process, simply leave the cabin in good condition and the key where you found it. When you book your rental, there is an option to have a late check out time of 12PM for a fee of $30. What are the benefits of a vacation home rental over a hotel? We have cabins in various locations. They are all 20 minutes or less to various attractions of Natural Bridge and the Red River Gorge. Red River Green Cabins are off-grid and located near Martin's Fork Trailhead on Nada Tunnel Road. Quiet Waters is a complex of cabins near Natural Bridge, Middle Fork Campground and Mill Creek Lake. Chop Chestnut Cabins are on a secluded ridge between Stanton and Slade. There is a Kroger in Stanton: about 20 minutes drive away. The address is179 West College Ave, Stanton, KY 40380. Local gas stations also have an expanded grocery and camping selections. 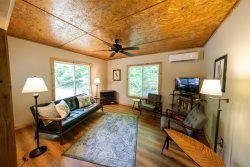 Can I change the dates or cabin of my reservation? Yes, we require 3 weeks notice and charge a $35 change fee. Can I receive a refund if I cancel my reservation? If you cancel more than 3 weeks before your reservation, we are happy to issue a full refund minus a $35 cancellation fee. Once it is less than 3 weeks before your reservation, payments are not refundable. What if the weather is bad during my vacation? We issue refunds if adverse weather conditions endanger guests' ability to travel: ice, heavy snow, severe flooding, etc. We do not issue refunds for cold or rainy weather: a great time a enjoy the hot tub or play games inside! What if during my stay I run out of propane, the hot tub jets aren't working or I can't find a bottle opener? Call or text us any time! 859-363-6091 We want you to have a great vacation, and we are happy to help problem solve so that your needs can be met. We will respond to you as quickly as possible.